This is a list of the most commonly-asked questions, with concise answers. If the answer to your questions were not found, please email us. What is required of me if my child is attending a Spa Birthday Party? Parents of the birthday girl, as well as all guests, must read and digitally sign our Policy Page. Please Click Here. It explains everything! Where are Mobile kids Spa Parties by Mountainside On-Site Massage held? Parties are held in the venue of your choice: at home, in a hotel, or anywhere else you choose that can accomodate us. How much space is needed? What else do you require? The manis can be done with or without a table. The pedis can be done with or without chairs, but chairs are preferred. The facial/massage area is about 10 X 8, but can be reduced in size if need be. We need access to a few outlets, and if doing foot soaks, or facials, a sink as well. For the chocolate fondue, a microwave oven will help. For the fizzy bath bomb craft, a freezer is required. What is the pricing for packages? Why aren't there prices listed? We charge based on the number of attendees, times the number of activities each receives, plus any fee-based add-ons. You are not charged for a set amount of time for the party. Nor is there a travel fee, or a required gratuity. If you choose to tip, that's entirely your choice. Please e-mail for rates. We keep prices unpublished because that's just how we choose to present our services. How do we book a Girls Spa Party? Call 877-480-8038, or Click Here. to leave your details on our contact form, whichever is easier for you. All parties dates must be secured by deposit. How much is the deposit? Is it absolutely required? The deposit is $100, and that secures your date and time for the party. There are no exceptions for this requirement. The deopisit is nonrefundable, but may be used for a different date if you must postpone. Our minimums are as follows: 18 Girls (including birthday girl) for one service; 10 girls for two services, 8 girls for three services, and 7 girls for four, or 5 for all five services. How long is a typical Kids Spa Party? That depends upon the number of guests, as well as the number of activities each guest will receive. (Ruby Package = 2 Services; Emerald Package = 3 Services; Sapphire Package = 4 Services; Diamond Package = All Five Services) The number of additional services requested will also affect the time. (Body Glitter Art, etc.) Also, you must allow time for eating, cake, and any other special plans you have. Do guests choose which Spa Activities they will participate in? Of course! Guests may only choose from the activities that the Birthday Girl's parent's have chosen to be available out of the five we offer. No guest is ever forced to participate in any activity. What are the Spa Activities? There are 5: 1. Mani Nail Art, 2. Essential Oil Foot Soak & Pedicure Polish, 3. Pediatric Massage, 4. Facials, and 5. Hair Styling. Are there any free included activities or extras? Yes! There are now six different crafts. Kids get to do these in groups. Kids under ~12 or so should have adult or older sibling supervision. They get to take home the fruits of their labors in brown paper bags. There is also a foamcore birthday card that the kids create with markers and stickers. Are there any other fee-based add-ons? Chocolate Fondue Fountain, Gift Bags, Sparkling Cider, Lanyards, Thank You Cards, Custom Mailed Invitations, Body Glitter Art, Printed PHotos From The Party, Memento Gift Cards, Choclate-making Craft, Jagua Temporary Tattoo (requires parental consent). We offer themes as well. There's the Sleepunder, Dance Party, Kids Yoga Session, American GIrl Doll Party, Girl Scouts Party, and our Groovy 60s-Themed Party. Please inquire or click here for more info. Do you provide services for older party guests? Pets are great! But dogs and cats seem to like licking the facial masque ingredients out of the bowls! For that reason, it's definitely best to keep them elsewhere. Plus, any one of the guests may be allergic. Will you fly to a location for a party? Again, please e-mail. We would first suggest you take a visit to the NYC/ NJ Metro Area as part of your little girl's celebration and have a Spa Party here at a spacious suite in a storied hotel, instead! : ) What can beat a trip to New York for your daughter's tenth birthday, bringing along four good friends?! A Birthday Week in NYC is a solid plan! No; not for any party within our area. However, a fee for parking in a hotel garage may apply if you are in Manhattan or any location where we are required to park in a garage or lot that does not permit free guest parking. Some hotels in New Jersey fit this category. Are parents able to customize party packages? Parents may choose which activities to include or not include as available choices for guests. Add-ons also provide for individualization. We have many custom Kids Spa Party invitations designs as well. We provide Spa Party decorations, including colorful throws, Spa Pillows, ribbons, and pink or purple tablecovers. Can we put up other Birthday Party decorations? Do we need to cover the furniture? We bring throws for the couch. If you are having the girls in the dining room for cake, as most parents do, be aware that this has been the number one spot for accidents. With especially energetic and kinesthetic kids, cake may end up on your upholdstered chairs. After the last time witnessing this, I said I'd add a section explaining that we suggest some sort of covers for upholdstery in the dining area. This can save a lot, in terms of stress, later. It can be as simple as an old sheet stretched across the rows of dining room chairs. Or, you may want to go with something more decorative for sake of the pictures. Please Click Here to link to our Spa Party Ideas Page. Do you provide cake or candy? We offer an add-on with melted chocolate, either in a fondue pot or flowing fountain. We also bring sealed containers of cut pineapples, strawberries, and cookies to dip as part of that add-on. These are opened at party time. What elements are part of the spa decor Mountainside On-Site Massage provides? Colorful LED (kid-safe) candles, aromatherapy essential oil to scent the room, running water fountains, many smaller LED candles, and spa music. 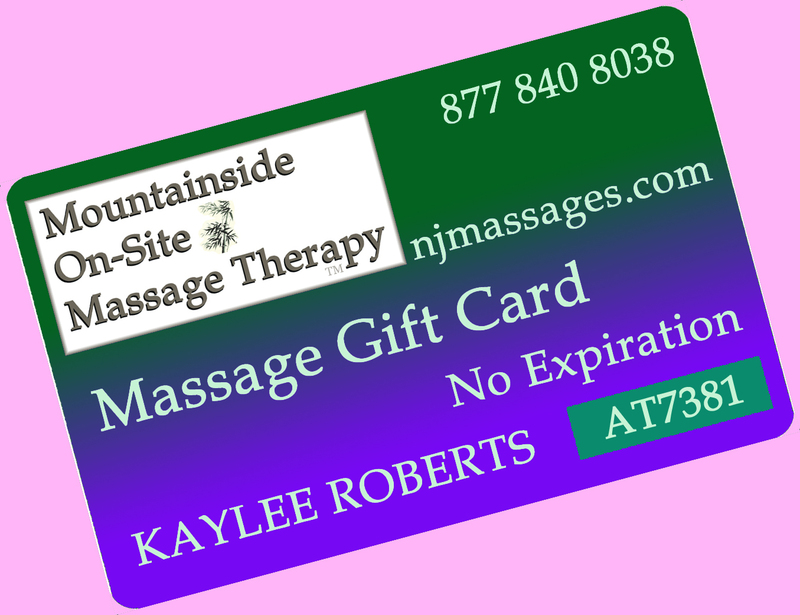 What does Mountainside On Site Massage bring for the party? If it's a full party, with all available services, it's a lot of stuff! There's the nail polish bags and mani area supplies, foot basins, facial area stuff, hair styling tools, and mats for facials and massage, as well as spa music, art supplies for the Spa Card, Lip Balm craft staff, and anything else you've added on as extras. That depends. For just mani-pedi parties, set-up is faster. For a party with all services, plus chocolate fondue and an extra craft, set-up time will increase. Just tell us when the party starts; we will know how much time we will need, and will let you know when to expect us. We are LMTs and Certified Pediatric Massage Therapists. Here is our credentials page. We have also done many, many parties. Check out our Testimonials Page by Clicking Here. We will get there! We've done parties during huge snowstorms! (The melted chocolate was that much better, we were told!) Please be sure the guests are still planning to attend! We can reschedule if need be; don't get stressed! We do reserve the right to postpone if it's ridiculous out. What if my daughter gets sick? Oh no! We hope that everyone gets better, soon! Please let us know ASAP! We can definitely reschedule. What if there's a family emergency? Oh no! We hope that everyone, and everything, is fine! Please let us know ASAP! We can definitely reschedule. What if the Therapists scheduled for the party get sick or have a family emergency of their own? We hope to never get sick and eat our oranges every day for Vitmain C! =) And, of course, we always hope and pray that all is always well with everyone else. However, in the event of these contingencies, we respectfully request the right to postpose and reschedule. Your daughter may be sad. She may even cry. But if one of our family members is on their last breath, she must understand that it's kind to consider others. Likewise, if we have 102 degree fever and chills and vomiting with the flu, you really shouldn't want us around. It's in the interest of everyone else; spreading the flu is not a friendly act! What if five out of twenty girls don't show up? No worries; you will only be billed for the number of girls actually attending, and not the number you planned to have. (That would be just wrong.) We've been told that that's the policy at nearly all other Kids Spa Party providers. We're glad to be different! : ) If you do not meet our minimums for your particular party package because one or more girls did not attend as planned, we will charge the minimum, and let the girls attending the party have the option to receive the extra services, so that you are not billed for nothing.